Wifi network is not secured as compared to wired network. The reason is that wifi signal can easily reachable to hackers if they are in range of your wifi network signals. So, why we use wifi? The answer is very simpler, wifi is much cheaper than wired network and network area remains clean from wires also there is less chances of damage network material. 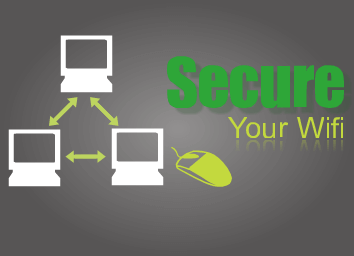 With wifi network you can modify network settings in order to prevent hackers to use your network traffic. Things are very easy. To secure your wifi network I am giving you some tips to avoid hack to reach your network access. There are some strategic changes you can adopt in order to reserve your wifi signals within your range not others. If you place your wifi device somewhere near outdoors or near window then hackers can catch signals easily. So place your wifi device at center of your building of home or office. Locating wifi device at center of building will help you providing strong signals all over building and you can use anywhere within range. Above is only a strategy to get full available signals from your wifi device. Now I will guide you how you can make wifi more secure by changing some network settings. DHCP stands for Dynamic Host Configuration Protocol and it used to configure network devices. So it means if you activate or enable DHCP on your wireless network then hackers can configure your wifi device. So it is better to disable DHCP. Same like DHCP I strongly recommend change the SSID code and disable broadcast on SSID. SNMP stands for Simple Network Management System. By default it will be available on public network. As name show it is a network management system so it holds all wirless and IP related information. So disabling SNMP will help you, otherwise hackers can get necessary information from it. WEP stands for wireless encrypting protocol. As it encrypt the traffic on your wireless network. So must use WEP in your wireless settings. Let me know what you want to know?